STAR TRACE Industrial high intensity high gradient dry permanent Magnetic Roller Separators are roll type dry magnetic roll separators with fixed magnet having high field intensity and gradient. The roll type magnet used in the Roll Magnetic Separators are made of alloys of rare earth magnetic elements and are more powerful as compared to other magnetic types. The magnet generates high attraction forces on the magnetic rollers due to their properties and special magnetic series. STAR TRACE High Intensity Magnetic Roller Separators are roll type dry intensity magnetic roll separators with fixed magnet having high field intensity and gradient. The roll type magnets used in the Roller Magnetic Separators are made of alloys of rare earth magnetic elements and more powerful as compared to other magnetic magnets. They generate high magnetic attraction forces on the magnetic roller due to their magnetic properties and special magnetic series. The obtained high magnetic attraction forces have low magnetic sensitivity and therefore they make it possible for this high magnetic force to separate very fine low magnetic minerals with a high recovery. The most distinguishing property of Intensity Magnetic Roll Separators are used in roll magnets that are an alloy of rare earth magnetic elements produced domestically and more powerful magnetic force.. Magnetic Roll Separator Systems have a number of standard sizes in which the high gradient roll magnetic separators are produced, and all of this type require a low installation height. It is also possible to make a Magnetic Roll Separator system in accordance with customer specifications. Depending on the requirements made and the application, a choice can be made for a single stage Magnetic Roll Separator system or multiple stage magnetic roll separator under one another. This results in an even higher degree of iron separation. Our latest developments in higher gauss value with star ultra super rare earth magnetics with highest intensity ,high gradient type magnetic arrangement in special proprietary configurations are now available after extensive research and development. STAR TRACE is one of Asia's leading Magnetic Roll Separator manufacturing Company in Permanent Magnetic Equipments and Vibrating Equipments in Dry/Wet type Separation of minerals and metals. The Dry Permanent Intensity Magnetic Roll Separators systems are unique in nature and we are supplying similar magnetic equipments throughout the world and more than 1000 Industries are having our magnetic Equipments. In our past 25 years of experience, we can separate from Coal to Gold in all minerals and metals from anywhere in the world, depending upon on their mining location, we are able to provide you complete magnetic solutions to upgrade your metals, minerals and your processes in magnetics. These Intensity Magnetic Roll Separators are highly effective of magnetic separation of para magnetic particles and weakly para magnetic particles separately. These Rare Earth Magnetic roll separators are made up of very high power specially developed Nickel, Iron Boron (Nd-Fe-B) with highest magnetic power available in the series to enable us to achieve very high gauss value compared to other similar products. Right now, we have developed latest Magnetic Roll Separators with a diameter of 150mm which gives higher magnetic force and more contact area than the normal 100mm diameter magnetic rollers. This type of Magnetic Roll is specially configured with configurations of suitable magnetic material sizes and its magnetic properties.The Magnetic Roll Separators have been passing through the belt which the material is running, is made of different type magnetic materials with different thickness to suit effective beneficiation of separating minerals and metals. These effective magnetic roll separators can be achieved with different type of thickness of belt ranging from 0.25mm to 2mm and some of the belt material which we have been using are having a non stick property and they are highly resistant to abrasiveness. Some of the belt material are coated with Nylon for its non stick property. These belts are basically made up of Kevlar, which is a Bullet Proof material and highest strength of its kind. These STAR TRACE Magnetic Roll Separators are having several passes to make sure of highest purity can be obtained by which several magnetic process repeatedly without much material handling. These Magnetic Roller Separators are primarily used in replacement of old magnetic technology of induced magnetic roller separators. Magnetic Roll Separators consist of two rolls, one of which is magnetics. There is a belt between them to carry the ore into the magnetic field. 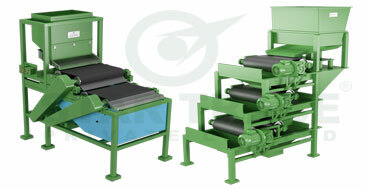 The movement of the belt in the Magnetic Roll Separator is controlled by a motor fixed to one of the magnetic rollers. The rotational speed of magnetic rollers can be adjusted according to the magnetic material properties and type. The material to be processed is conveyed to the belt by magnetic vibrating feeder at a required rate. Feeding rate can be controlled by adjusting the vibration on feeder. A magnetic Roller separators blade has been set in order to be able to collect separated magnetic products in different places and to adjust the product properties in a desired manner. Magnetic Field strength (measured indirectly and controlled by amp adjustment of the electromagnet) typically up to 15,000 gauss. magnetic Roller speed ( normally fixed and only adjusted by pulley and belt changes). The magnetic roll &rollers types incorporated in our machines have been specially designed and developed to generate exceptionally high magnetic field and magnetic gradient. The magnetic rollers which are built using rare earth Nd-Fe-B are manufactured to very low dimensional tolerances. The magnetic roll incorporated in our Magnetic Roll Separator has been specially designed and developed to generate exceptionally high magnetic field and gradient. The magnetic rollers which are built using rare earth Nd-Fe-B is manufactured to very low dimensional tolerances. Single or multi stage magnetic separation. Standard 2.5, 2, 1.5, 1, 0.75, 0.5 and 0.25 meter wide magnetic rolls are incorporated inthe Magnetic Roll Separator .They are also available in a laboratory scale magnetic model with readily interchangeable roll of 100 mm length. Supplied with a magnetic vibrating feeder to suit the magnetic roll width. Simple conveyor belt tensioning and tracking system accessible at the sides of the magnetic machine. Fixed or-variable speed magnetic roll drive options. Fractional HP motor having voltage and frequency to suit user. Induced Magnetic Roll Separators are primarily used for magnetic separation or concentrating minerals or materials of low magnetic susceptibility.Uses include extraction of minerals of type iron or chromium bearing minerals from silica sand, the concentration minerals such as wolframite, the removal of paramagnetic minerals such as Iron Titanium Oxide (Ilmenite, FeTiO3), Iron Carbonate (siderite, FeCO3), etc., from valuable non-magnetic minerals, and purification of dry granular chemical compounds and abrasives.These self-cleaning magnetic roll separators selectively removes magnetic components out of a conveyed material and discharges them as distinct and clean material. Field intensity is adjustable for recovery of selective type. Very high magnetic gauss of 20,000 is achieved by the magnetic roller separators. The bulk density - higher magnetic values increases throughput. The flow characteristics - these are determined by magnetic particle shape, surface condition and moisture content. Better flow characteristics increase throughput in the Magnetic Roll Separator.